One of the most unusual and unique advertising gimmicks that I have ever encountered as a travel writer was found in Sister Bay, Door County, Wisconsin. In 1973, the owner of Al Johnson’s Swedish Restaurant and Butik began renovating his restaurant by importing wooden logs from Norway to make it more traditional. After the renovation was complete, Winky Larson, Al’s best friend, brought him a goat named Oscar as a joke, and someone decided to jokingly put Oscar on the roof, where he then caught the attention of pedestrians. This inspired Al to get more goats and put them on the roof, and they have been there ever since. 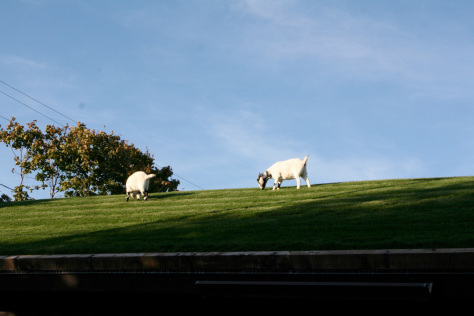 In 1996, the Johnsons registered the “Goats on the Roof” trademark, so that no other restaurants can have goats on their roofs. During a recent visit to Sister Bay, I saw a camera-carrying crowd gathered outside the restaurant to view the famous goats as they grazed on the sod roof while inside, diners can see the goats right from a new 42 inch flat screen TV in the foyer. A popular vacation and tourist destination, especially for residents of Wisconsin and Illinois, Door County has many things to offer to tourists. The tourism department promotes the county as a vacation destination truly “like nowhere else.” Door County is home to 11 lighthouses, unique communities, performing arts, entertainment, music, boutiques, galleries and mouth-watering cuisine — from gourmet to casual, formal to waterfront easy. Door County referred to as “Death’s Door territory” by the French during the 18th century got its name because the strait between what is now the Door Peninsula and Washington Island was so hazardous for ships that it led to many vessels being damaged and shipwrecked. A visit to Cana lighthouse shows navigational problem encountered by vessels in those days. The county’s year round population is only 28,000, but due to the tourist explosion, it reaches as high as 250,000. Most businesses who cater for tourists close during the off season. It is believed that no entrepreneur is prepared to venture opening a MacDonald’s in Door County because of its low and seasonal clientele. You are advised to wake up and smell coffee at Door County Coffee & Tea Company. The company is Door County’s premier coffee roaster, offering such delicious flavours as cherry crème, raspberry butter crunch and caramel pecan. As soon as you walk in the front doors, you will immediately enjoy the smells of more than 100 types of coffees – all of which are roasted on site. It’s a popular joint for local as well as visitors because it uses finest specialty Class 1 Arabica coffee beans grown throughout the world and roasts in producing a perfect roast every time. “ Our passion is quality. We know we’ll never be the biggest, but we believe we can be the best,” beamed owner Vicki Wilson. On a personal note, I was amazed when Vicky, who started the business in 1993, offered me a package of pure Tanzanian coffee, making me nostalgic about the country of my birth! With a large Scandinavian population, a fish boil is the area’s culinary tradition. The fish is typically caught by local fishermen, cut into small chunks and cooked in boiling water with red potatoes and onions. Salt is the only seasoning used to raise the specific gravity of the water. 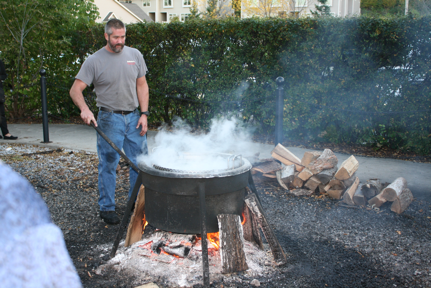 Fish boils, cooked in a large kettle over a wood fire, are offered at many Door County restaurants. At the end of the cooking, the cook throws fuel oil or kerosene on the fire. This “flame up” causes the water to boil over. The fish and vegetables are served with melted butter. This meal is traditionally followed by cherry pie, a traditional dessert in the area. The cooking is an elaborate presentation and our group and other patrons were asked to arrive half an hour before the cooking starts. Door County’s soil and weather conditions — long, cool but frost-free springs, and warm summer days and cool nights — are influenced by Lake Michigan and Green Bay, creating an ideal environment for growing cherries. Door County takes pride on its cherry orchards, and a history of cherry growing that dates back to the 19th century. Cherries have been a part of life in Door County dating back to the 1800s. Over 2,000 acres of cherry orchards in Door County come alive each year signaling the start of the season — from mid July to early August, you see plump, red cherries dangle from branches in the summer sun, ripe for picking, baking, and snacking by the handful. Each year, droves of cherry enthusiasts flock to Door County, grab a pail or two, and saunter out into the orchards to hand pick their treasure straight from the tree. Orchard Country Winery and Market is one of the favourite places to visit in Fish Creek. Tourists here can tour the orchards, taste the wines or peruse the market for specialty products such as cherry pies, cherry juice and cherry jams. Visitors can also see while workers bottle the popular fruity wine, Cheery Blossom and pack them ready for shipment to other places in the US. Nestled in the heart of the Door County Peninsula, is the picturesque village of Ephraim, which settled in 1853 by Norwegian Moravians on the tranquil shores of Eagle Harbor. Ephraim takes pride in its Scandinavian roots, carefully preserving its rich heritage in more than 30 historical sites, 11 on the National Register of Historic Places. Among their historic buildings are the Moravian Church (1858), the Pioneer Schoolhouse (1880), the Anderson Store and Warehouse (1858) and eight homes in the village – all of which are more than century old, but still in use. From here, tourists can explore Eagle Harbor, kayak or paddleboard or rent a boat to enjoy the panoramic view of Ephraim and nearby Peninsula State Park. Highly recommended to Ephraim tourists is a lunch at Wilson’s restaurant and Ice Cream Parlour, which has been a Door County landmark since 1906. Visitors usually making their first stop at the restaurant will have to put up with the crowded restaurant to taste its old-fashioned soda fountain and ice cream specialties, home-brewed draft root beer, flame broiled burgers and juke boxes playing classical music.